I am standing in the foyer of a large Victorian house. This is the Mystery House. Having let myself in through the front door I am now faced with seven people all standing in a row, neither moving nor talking, and each one looking at me with the same unblinking, lifeless eyes. And it is getting dark. The common knock on this (very) early adventure game from Sierra On-Line's Ken and Roberta Williams is that while it has a deserved place in video game history, it's plainly not a very enjoyable video game. 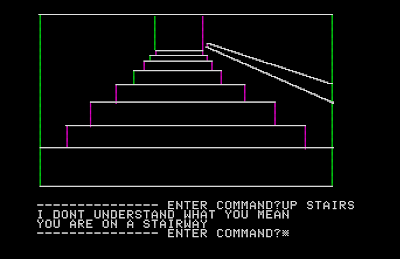 It certainly was an innovation, though, being the first adventure to feature full, albeit primitive, computer graphics in addition to the usual text. And this is why Mystery House is remembered: for its historical significance, kind of like Birth of a Nation, or polio. 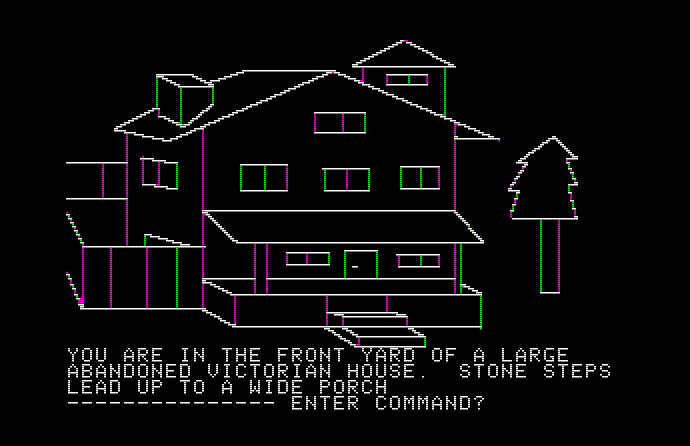 Mystery House is ostensibly a mystery story, one told through crude line art, constrained prose and a barely functional text parser. The premise is that of these seven - guests? residents? - one is killing off the others, and possibly the player too, in an effort to claim some 'jewels' rumoured to be hidden in the house. This mystery is not, as Poirot would say, "all that." The killer dumps all of the bodies out in the open, for the player to not so much 'discover' as inevitably happen upon in the general course of being alive. And as to which of the seven is the culprit - a creative choice that is basically arbitrary - the murderer kills the other suspects within minutes of the game commencing, which takes a lot of the guesswork out of this case. The puzzles in this game, such as they are, have nothing to do with solving murders. The player is just present in the house while murders occur as a matter of routine. So if this is a mystery game, it sounds pretty easy, right? Like Poirot would say, "as if!" 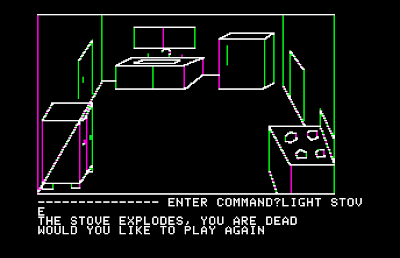 Mystery House is unintuitive, frustrating and near impossible to complete unassisted - but not because of the mystery. 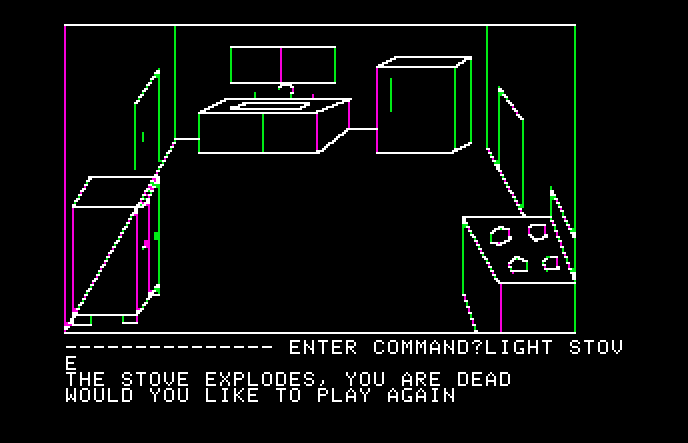 This is a game about a house. The player's time is occupied not by the solving of murders but discovering secret passages and tunnels within the house or wrangling the text parser to do things like turn on the faucet in a kitchen sink ("WATER ON"). Navigation should be as simple as typing either "NORTH", "SOUTH", "EAST" or "WEST" where appropriate, but any doors, gates, stairways or holes all require unique commands that you must figure out as you go along, like constantly relearning how to walk or "GO HOLE". It isn't this easy, either. Often these compass points don't even correspond correctly to what's on the screen. Exiting a room through the west door may take you outside, into a forest, where you might think typing "EAST" would bring you back inside, but actually the right command would be "UP". Go east and you delve further into the forest, which appears to be infinite in all directions and every screen of it literally identical. The game is remarkably unhelpful about all of this, actually. If you're on a stairway and want to go UP STAIRS, Mystery House responds, I DON'T UNDERSTAND WHAT YOU MEAN. 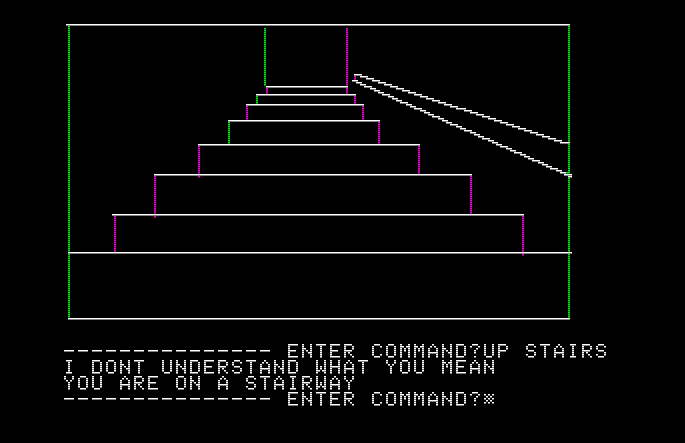 Then adds, as though you are confused: YOU ARE ON A STAIRWAY. The true challenge of Mystery House arises from handicapping the player's ability to function within a world. The art is often incomprehensible: you don't know what you're meant to be looking at. The text parser dismisses direct requests out of hand as clearly nonsensical. The rules change on a whim: from one screen to another, up literally becomes down. Interaction is necessary but often punished: lighting a stove, for instance, will cause it to immediately explode and kill the player. 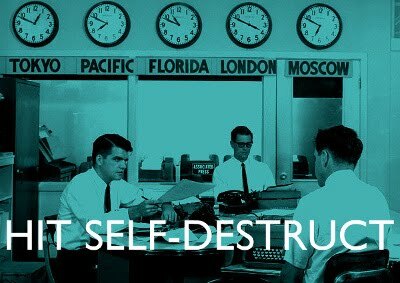 Ultimately, through technical and design ineptitude, the basic act of survival is made a constant struggle. 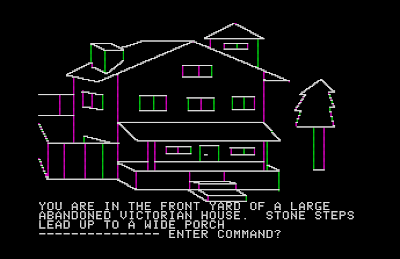 And in that way, Mystery House is something more than the first graphic adventure: it's the first survival horror game. Read literally, Mystery House is not a mystery story but a recurring nightmare, unbound from real world logic. You appear on the doorstep of an unfamiliar house with no idea why you should be there. The world is rendered in unclear black, green and purple murk. Seven strange people, all alike, stand motionless in the foyer, staring at you, but you cannot touch them or speak to them. Then they vanish, and you find them dead. There is no way to leave the house. Once you enter the front door, it locks behind you. You walk through a door in the kitchen and into an endless forest. Dying doesn't end the dream: it only sets you back outside that front door, to look at those creepy people again, to find that book of matches again, and light them and lose them one by one, staving off the darkness in interminable style. You cannot talk. It is difficult to move. This is the nightmare where you are in danger and cannot make your legs walk. In this nightmare, all you can do is run through this empty chamber of a house forever, because you don't know how to leave it and perhaps cannot, fumbling around in the dark while you are told, repeatedly, that you are bad at things like moving. Catharsis comes in Mystery House not when the mystery is solved but when you start attacking the house itself. Later in the game, you must pull furniture and masonry apart, let fires burn holes in the floor and smash down walls with a sledgehammer. You are not exploring the house at this point: you are violating it. And after all it's put you through, seeing this house destroyed is a welcome brutality. When the end arrives, the killer is dead and you've found both the jewels and the key to the front door: the exit, at last, to this house. You open the door, you go door, and are informed via simple text that you've won the game. Then, it asks, would you like to play again? I type "no", and press enter. You will never leave this house. Nobody likes Mystery House. But this house always wins. Nice job, I like it. Almost makes me want to play it. Almost.